This jewels is just perfect for the evening appearance. 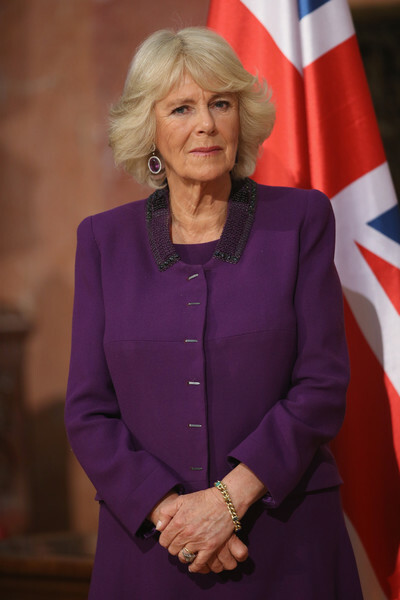 It was just the right kind of necklace Camilla pulls off best. It wasn't those large heavy necklaces that appear to pull her neck down. It complemented her neckline gracefully. Lovely. 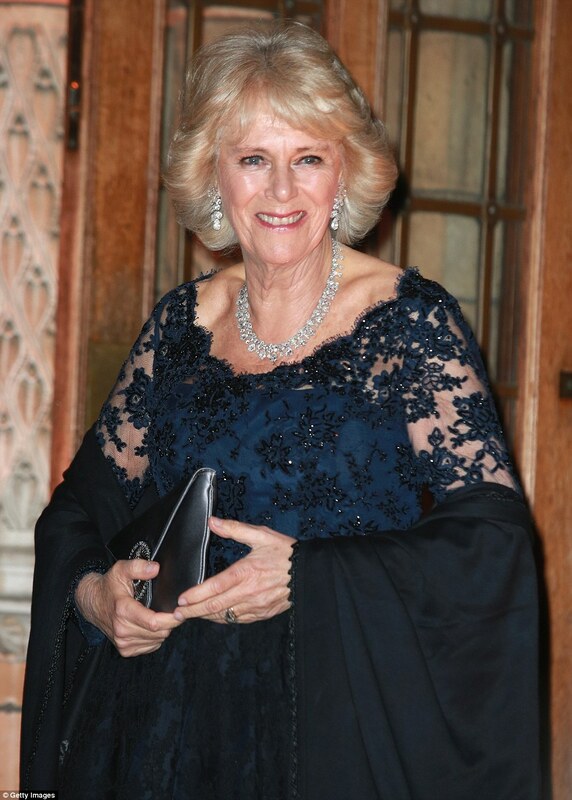 That said, I thought her sapphire demi - parure would have looked lovely as well. A very good choice! Especially with the earrings. I think that I adore the earrings even more than that gorgeous necklace. On February 3 the Duchess wore nice earrings, diamond rosettes with a round pearl dangling from them. She didn't wear a brooch. Indeed they are. They have been to Country Fetes and Gala Banquets and everything in between. I've decided I would love to have some "everyday" earrings just like them. 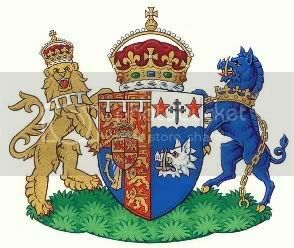 They may not get to a gala event but I am sure I can manage the Country Fete! 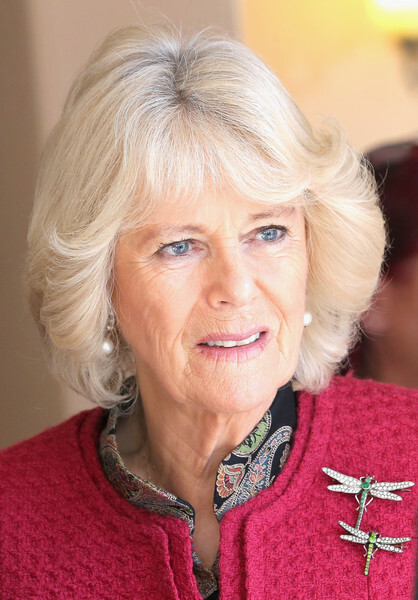 It looks like Camilla has acquired a new dragonfly brooch, unless previous photographs were deceptive. In previous photographs, the dragonflies appear to be the same or nearly the same size. The stones on one of the dragonfly appears to be all diamonds. In the recent image, the new dragonfly is smaller/larger and a different color. The larger one appears to be the new brooch. The smaller one is the same color as previously photographed and the color stones cover the entire body. It appears as if the top one in the old image is the bottom one in the new image. I like that with the colour of the suit and her beautiful earrings, she gave her whole look a little more gravitas than it would otherwise have had. I also sniggered at the DM referring to her wearing "diamond hoops". Obviously, their duty spotter missed the whacking great gorgeous deep amethysts in the middle! 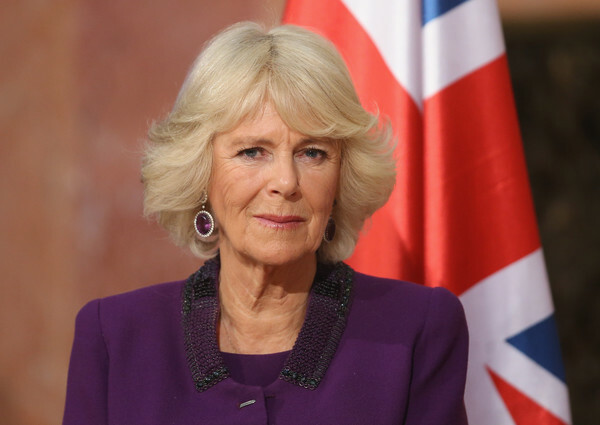 Looks like Camilla might have a new set of jewelry. Lovely. I suspect these were presents received at some stage. Good to see her use them. Her necklace appears to be very similar to this image.